Barry Windsor-Smith · Frank Bellamy · Heads Up! Heads Up: Tully and Bellamy’s “Heros the Spartan” in 2011? There’s also a listing for Heros the Spartan at Amazon.ca with a ridiculous publication date of “Dec 31 2035,” but the ISBN-10 and ISBN-13 numbers are the same as in the listing at Amazon.co.uk, so I think Bellamy fans have reason to believe that a collection really is in the works. Given his fond memories and admiring assessment of Heros the Spartan, I would imagine that BWS was pleased to be profiled, along with Frank Bellamy (and eight other comics luminaries), by P. R. Garriock in his 1978 book, Masters of Comic Book Art. 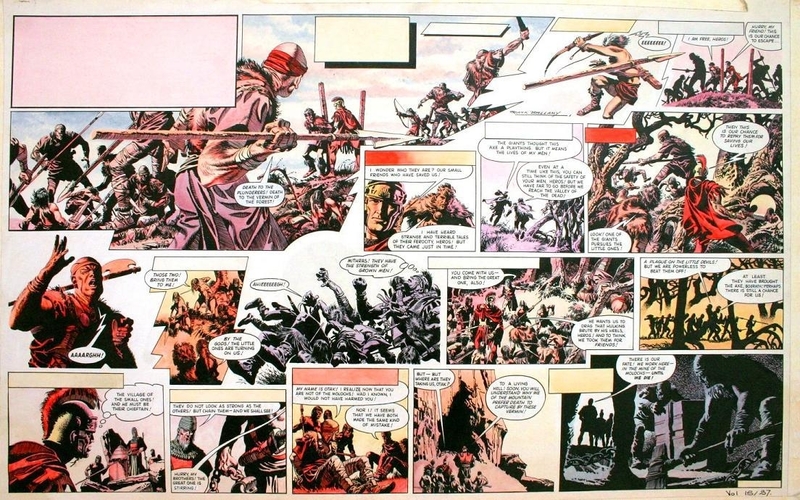 As I recall, one of the highlights of Garriock’s book was the inclusion of an episode of Heros that had been “exhibited in New York in 1972 when Bellamy received the award for Best Foreign Artist from the Academy of Comic Book Art” (Garriock, p. 38); a monumental battle sequence, the strip was reproduced in full-colour across two full pages — 40 and 41 — of what was a 9-by-12-inch trade paperback. The other artists profiled by Garriock included Richard Corben, Robert Crumb, Philippe Druillet, Will Eisner, Jean Giraud, Harvey Kurtzman, Victor Moscoso, and Wallace Wood. Thanks for taking a moment to post confirmation that the project is, indeed, in the works. It’ll be interesting to see how large the actual volumes are. 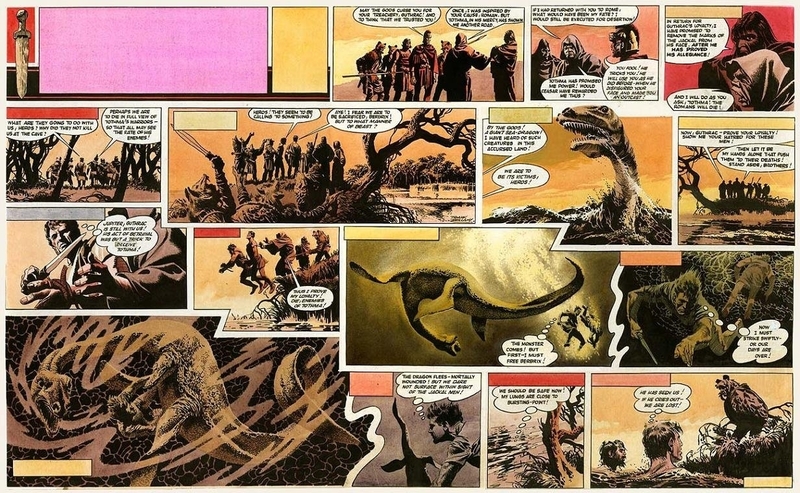 Of course, hard-core collectors want the pages to be as large as the original strips, but if that’s the case, the book will be so expensive that the hard-core collectors are the only ones who will buy it. P.S. Fans looking to compile a Bellamy collection would do well to start their search at Norman’s Web site, Frank Bellamy – The Checklist. More information here: http://bookpalacebooks.blogspot.ca/search?q=heros. Looks like Book Palace is going to be the publisher, not Titan. Unfortunately, the book is going to be VERY large, and VERY expensive, i.e., for VERY serious collectors with VERY deep pockets only.